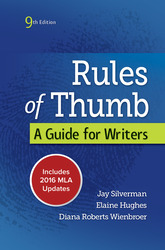 Rules of Thumb is a concise, user-friendly, and affordable handbook developed around students' real writing needs. An invaluable companion for writers at all levels, it gives students the advice they need on writing, research, grammar, and style in a clear and engaging voice. Reflecting the most current APA documentation styles, the eighth edition remains the ideal handbook for improving grammar without overwhelming student writers with specialized terminology. The Meaning of "Rule of Thumb"